For Valentine’s Day, the Norovirus. How Sweet. If you suspect someone has the norovirus, run as far and as fast away from that person as you can! Not to be confused with your basic, everyday flu, the norovirus is an instant, violent, ravaging, wicked virus that will take you down before you even realize what is happening. Right on Valentine’s Day, I suddenly became so sick with this yuck that I lost eight pounds in twelve hours. I had to miss Eva’s kindergarten Valentine’s party, missed Vincent’s preschool Valentine’s festivities, and was only able to give the dozen roses George bought for me barely a glance before they wilted and died. With my body still weakened by nine months of pregnancy and childbirth less than three weeks before, I guess I was not strong enough to give this hostile virus much of a fight, and it ransacked me. I tell you—I would not wish it upon my worst enemy. After the initial onslought, you still aren’t done. You go on to spend the next few days in bed, unable to stand, while your stomach cramps up and burns like fire. Wow. Except for last month in the birth center, when the IV fell out of my arm (taking all pain medication with it) and then a fumbling anesthesiologist could not figure out how to insert an epidural just as Valerie shocked us all by suddenly appearing out of nowhere, the virus is the worst pain I have ever experienced. Ever. The upside is that G was able to hand the boat off to Bryan to take out and run through the Dungeness crab gear for a couple of days (thank you, Bryan!! ), and then a storm blew in on the coast so G got to come back home and help deal with the aftermath. I guess I can also be grateful that as a result of all this sickness, I’ve been able to start phasing out my maternity clothes more quickly. The most amazing thing is that, while Eva and Vincent did get mild cases of the virus, Valerie and George emerged unscathed. I was so worried about Valerie; I don’t know how a three-week old infant could have withstood this. Praise God. So, that was my Valentine’s Day. Never a dull moment around here! I hope that at least you all enjoyed a pleasant and healthy Valentine’s Day! There’s always next year. Sweet Valerie, dressed in yellow and scrubbed in sunshine. Happy one-month birthday! Hello, Extreme Exhaustion. I’d Forgotten All About You. The baby is in her bassinet for a few minutes and the older children have been taken out to dinner by our friends, so I’m taking this moment to let you know that no, I have not abandoned my blog. I’ve simply been taken over by unbelievable exhaustion. Valerie is three weeks old now and I am STILL dashing to my bed or to the couch every possible second that I can. 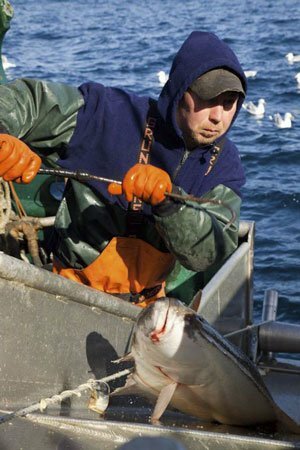 When I was a younger gal working as a deckhand on my dad’s seine crew, I thought I was deprived of sleep when we’d go to bed at 11 p.m. after reaching the fishing grounds and then wake up at 3 a.m. to get ready and set the net. And then, once Eva was born, I thought I was sleep deprived when I was up every two hours with a fussy newborn. But wow—nothing compares to this! Being awake all night with a newborn and then getting up to meet the needs of two young children is definitely not easy. Thank goodness for my parents, who are still coming by to take Eva and Vincent to kindergarten and preschool each day. I don’t know what I’d do if I had to have everyone up, ready, and out the door in the freezing cold at 8 a.m. each day after being up all night. I have worked up to doing one afternoon pick-up each day, which makes me feel pretty good. I’m eager to rejoin the real world again but wow, this no-energy thing is killing me. I also don’t want to consume too much caffeine or other energy-inducing methods since I’m nursing and don’t want to inadvertantly keep Valerie awake any more than she already is. Valerie is now three weeks old, and George was recently able to make it home for one 24-hour period to visit with the kids and me. I was grateful that he found it worth arriving home at midnight and leaving the next day just to see us, and it was good to see him while he was here. 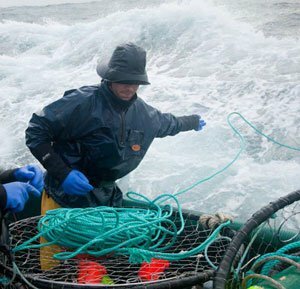 While not a huge disappointment, the 2012 Washington Dungeness crab season has been nothing compared to last year, which is not entirely unexpected. You can’t expect to have a stellar season every year! Fortunately, George will turn the boat around and head up to Alaska to catch the blackcod and halibut quota as soon as he ends the crab season. Unfortunately, he’ll be heading up to Alaska sooner than we expected. Darn! If you are one of the people who has written to me via my blog with questions and comments that I have not been able to get to yet, please know that I have received your inquiries and comments and I look forward to replying as soon as I can! Thank you for taking the time to write, and know that your feedback and questions are valuable to me. As soon as I get another moment when I’m thinking clearly, I will respond, maybe even in a blog post. My goal for this week is to rally long enough to make popcorn for Eva’s Valentine’s Day party at school, prepare a snack for Vincent’s Valentine’s Day party at preschool, and make sure the kids have made enough Valentines for all of their friends. I wonder if George will remember to send roses to me this year? I never hold my breath but I do always hope. Sweet Vincent hosted a tea party for Eva, Mommy, and Frog. Eva and Vincent making Valentines. Dad swaddling the baby on a quick visit home. Eva's Valentines for the crew. And Sweet Baby Valerie Makes Five. You may have guessed, based on the amount of time that has gone by since my last post, that our precious baby Valerie Joy has indeed been born. 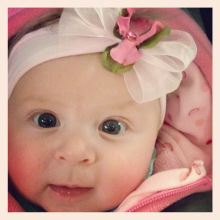 She decided to make a very rapid appearance on January 19, 2012 and was born in literally a matter of minutes! Valerie is a tiny little thing who weighed just 6 pounds, 5.8 ounces at birth and measured 19 inches long. While at the hospital, she dropped down to 5 pounds 8 ounces, but within just a couple of days was right back up to her birth weight. So far, she is a very mild baby who sleeps quite a bit; and thank goodness for that, because each time she sleeps, I race to my bed and sleep as well. George was home for the birth (although ironically, he almost missed it; he was eating lunch in the cafeteria with my dad, Eva, and Vincent when Valerie suddenly decided to burst forth. Boy, was he shocked when he ambled back into our room and realized what was transpiring!). George even got to stay for two extra days with me at the hospital thanks to a storm and its accompanying twenty-foot seas that kept the crab boats in the harbor on the official start of the Dungeness crab season. Sadly, George did leave over a week ago and the kids and I have been holding down the fort. We have had lots of amazing help from my family and friends; everything from school pick-ups and drop-offs, to meals, the sharing of baby supplies, the folding of laundry, and even a slumber party for the kids at the home of our friends. All of this help has been a surprise and a blessing. 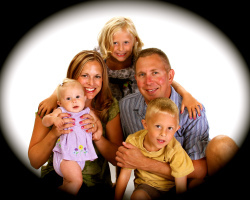 I don’t know what I would have done here with a newborn, two other little ones adjusting to not only the arrival of a baby sister but also the departure of their dad, and a household of chores that need to be kept on top of without such help offered to me. We are off to a good start thanks to so many. George and I also enjoyed some pleasant and uninterrupted time together at the hospital before he left which allowed us to reconnect with each other, enjoy the blessing of Valerie, and get our new family of five off to a positive and peaceful start. I will never forget how sweet it was to spend that time with him in total relief that Valerie had finally arrived safely and soundly, and be able to let go of the worry and anxiety that defined the pregnancy. I feel such physical and mental relief, such gratitude, the likes of which I’ve rarely felt on this level. My heart sings and leaps for joy each time I look around me and see these three amazing little blessings that God somehow saw fit to allow me to love, cherish, and raise. Astonishing. Eva holding Valerie at the hospital; her dream come true at last. Vincent and Valerie. My sweet buddy is slowly adjusting. Eva swaddled her pink bear. Maybe If I Sled Down a Bumpy Hill…. We are still here at home, waiting impatiently for the arrival of one baby girl. Wow. I have tried almost every safe and natural labor-inducing method known to woman, including two that the doctor and a midwife all but guaranteed would work….but no luck. I know she’s ready; I feel all the familiar signs and symptoms of a newborn preparing a grand entrance, but that’s as far as it goes. I’m trying to keep busy and I’ve actually gotten a lot done in this last week or so of torturous delay. I’ve ordered and gotten all portraits in frames, ordered a new cradle mattress, finished editing my e-book, received checks for both writing and teaching Jazzercise (I halted teaching at seven months along), organized scrapbook materials, attended the birthday of my dear friend’s son, and even transferred folders, created playlists, updated, and organized my dad’s iTunes account. I’ve waited impatiently for the snow to arrive, and even it is here now! One person who is not going to be here much longer, however, is G. I hoped and prayed and crossed fingers that the baby would come a few days early so that George would be here for the birth and a couple of days following. Now, however, unless the baby comes today or tomorrow, G may make the birth but will have to leave immediately afterwards. As in, within hours. For someone who struggles with anxiety, doesn’t like surprises, and can’t stand the unknown, this has been the most agonizing and difficult nine months of my life. There are no guarantees, no sure answers, and nothing is in my hands. My hope is that after this experience is over, I will look back in time and discover that I’ve grown in character, calmness, and patience by leaps and bounds. My two snow angels keep me moving forward! May the Dungeness Crab and Baby Party Begin Already! 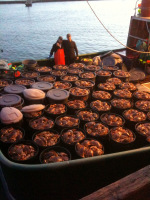 The boat left with a load of Dungeness crab pots last weekend. Although it is always sad to hug G goodbye and wave the crew off, it’s also kind of a relief. Especially this year. There has been so much waiting, wondering, and anticipation as to when the gear work will end, when the boat will leave for Westport, when the season will start, and if the weather will cooperate. And of course, this year we have the added anticipation of a baby due on the exact day George and the fellas will dump five-hundred crab pots to the bottom of the ocean, hoping the season will be profitable and safe for the five families—including at least a dozen children combined—who are relying on it. Ah, what can you do? That’s life, moving forward the way life tends to do. What an awesome, sweet, and tough crew we have in Bryan, Johnny, Brett, Oscar, and George. 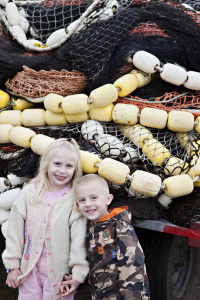 Precious and resilient commercial fishing kids watching Dad pull away from the dock. Johnny on top of the pots. George will have a few days at home in between getting the boat to Westport and when the season officially begins, so here’s still hoping the baby decides to arrive during the window in which he is home. The kids’ bedroom switch and redesign is complete; Vincent has cool new bunk beds, Eva has her rainbow/butterfly/flower room. Holidays are over, children are back in school, preschool, and activities. House is clean, Christmas presents are put away, writing invoices have been sent off. I’m tired of waiting; I’m looking ahead already to springtime, capris, sandals, renewed energy, evenings of sunshine and bayside cocktails, and a body I can actually move with ease and feel comfortable within. I love this picture of Vincent; he looks like he just climbed off a Dutch Harbor fishing vessel. Goodbye, 2011. Great to Finally Meet You, 2012. I just hung up my new 2012 kitchen wall calendar and deposited the 2011 edition into the recycling bin. I have to say—I am not sorry to see 2011 go. It’s not that it has been a bad year; for the most part, it moved along just fine. 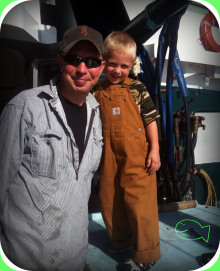 When I look back, I’m incredibly grateful for the health of my kids and family and a good year of fishing and safety for George and the crew. We had a couple of fun trips; Las Vegas in March and Kauai in April, and plans to start making vacations a more regular part of our routine after not taking any for years. But then I remember the way our beloved pitbull, Toby, died suddenly last April (the day before we left on our first family vacation in five years) after successfully and healthily beating a cancer diagnosis for three years. George left for Alaska and the halibut/blackcod longlining season soon after, and then shortly after that, I discovered we were unexpectedly expecting again. 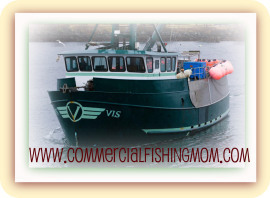 Pregnancy sickness lasted throughout the summer, fall, and now into winter, making the challenge of being a seasonally single commercial fishing mom much more difficult than it really needs to be. I have to say that after dealing with a variety of doctors, various medical offices and front desk staff, nurses, opinions, test results, and appointments for the past nine months, I would be happy to never, ever have to step foot in an office or deal with anyone in the medical profession ever again. I plan to write a much longer essay on the topic later, after I’ve had some distance and can gain perspective on this experience, but for now, all I can think is that I want this to be over. The good news is that in eighteen days (if not sooner), it will be. Assuming all goes well with delivery and the first few months with baby at home, I will so grateful to have my life, my body, and my peace of mind back. On the other hand, I now have a better appreciation and empathy for patients who struggle with chronic illness, who are told they have medical issues, troubles that can’t be diagnosed or treated effectively, who are not listened to or treated well by the medical profession, and who must attend appointment after appointment and try to stay pleasant all the while. I’ve written before that after struggling with the physical, mental, and emotional effects of infertility before we were blessed with our Eva and Vincent, I never dreamed I would have a third baby years later. I also never imagined that after such a wonderful experience with the one doctor who saw me through those first two amazing pregnancies, this final surprise would be so different. I’m going to spend these last two weeks trying to stay calm, looking forward to delivery, and then getting on with caring for a newborn and my two other children and letting the experience of the past nine months fade away in time. Moving forward and beyond is something I love to do, and I’m excited and eager to make 2012 a great year. So, we’ll have this baby girl in January, and then in the spring I will be launching my first e-book right here on this blog and via Kindle and other e-reader formats. 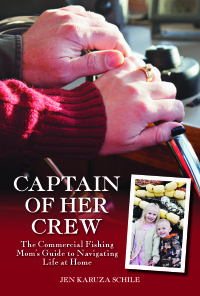 Details on the e-book will come in the following months, but I am extremely excited about this new project. The book is currently in design and editing stages and I know it will be something I’m proud of and that many of my readers will find useful. Speaking of blog readers; thank you to all for making 2011 a record year on Highliners and Homecomings. It’s been fun reviewing blog statistics, reading your comments, keeping an eye on subscriptions, seeing which posts get the most “hits” and which pictures get clicked on the most, reviewing where traffic is coming from and watching numbers rise. As we head into the fifth year, I want to sincerely thank you so much for the support and the time you take to come over and see or read what’s new. The best to you as we start this new year—health and happiness to all. Someone posted this on Facebook. It's not the most eloquent wording, but I think it's a sentiment worth keeping in mind. We knew December was going to be a tough month around here; getting ready for the Dungeness crab season, celebrating Eva’s sixth birthday, preparing for Christmas, entering the final weeks of pregnancy, and doing a major bedroom overhaul here at home was never going to be smooth or easy. Unfortunately, we had no choice but to do everything in four short weeks and it has been as overwhelming and tiring as we anticipated. There have been some highlights; our friend and neighbor’s help with the room switch, Eva’s birthday party turning out better than I’d hoped, and receiving Christmas cards from friends and family have all been little spurts of joy throughout. I’m probably a little more burned out than usual because I’m on new medication for the last four weeks of this pregnancy that makes me nauseous and tired. Of course, I’ve felt that way from the very beginning so it’s not a real change for me…just that I’d hoped for some relief before the birth. At one of my three-times-a-week doctor appointments, I finally asked one of the nurses why this pregnancy has been so much more difficult than the others. Is it my age? Is it the being watched like a hawk by medical staff that’s a spirit-dampener? Is it the mental challenge for someone who doesn’t deal well with surprise or change? Is it from exhaustion having two energetic children already at home? The physical strain of a third pregnancy? Most likely, it’s all of it. There is really nothing to do but see the rest of these few weeks out with as much grace as possible and hope for the best when it’s time to deliver. Speaking of which; we still don’t know whether George will be here for the event. As you know, the baby is due on January 25. 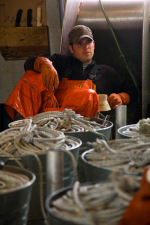 We finally received word that the official start date for the Dungeness crab season is January 24. For those of you that don’t know, that means they’ll set gear (dump 500 crab pots) about three days before, which is January 21. In order to get to the boat and out to the middle of the ocean, George will leave home on January 19. My best hope is that the baby up and decides to make her way out by herself on January 15. We do have an alternate captain scheduled to take the wheel and relieve George for a couple of weeks during the crab season, but George absolutely has to be there for the first setting of 500 crab pots. There are hundreds of thousands of dollars at stake, the safety of crew, and several families with children all depending upon getting the season off to the best financial and safest start possible. If the crab season had begun when it usually does, around the first of January, George could have set the first critical round of pots, got the season started, and then handed it off to the relief captain and come home for the baby. However, the season starting so late in the month put a big wrench in that plan. As I said, all I can do is stay calm, have a plan in place, and try to see these last few weeks through with as much grace as I can muster. 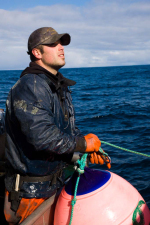 I want to take a minute and pay a small blog tribute to my old Southeast Alaska fishing friend, Monte, who passed away suddenly and tragically this week of a heart attack at the age of thirty-two. Upon learning this news, I literally doubled over and sobbed, unable to believe or comprehend what happened. I was sure my eyes were tricking me, that it was some terrible joke or hoax. Monte, who leaves behind a wife and six-month-old baby, was the sweetest, toughest, kindest, most original character you’d be lucky to know. At his funeral yesterday, I think everyone felt comfort that the music, stories, pictures, and video perfectly captured Monte’s authentic spirit and person. His love of fishing, the outdoors, creativity, wife, baby, friends, and helpful nature were all represented at his final departure from shore. Rest in peace, dear Monte. You will never be forgotten. The Launching of Dungeness Crab Pots AND a New Baby. All at the Same Time. Literally. George told me today that the Washington Dungeness Crab Fishermen’s Association has a new Facebook page, so I immediately went over and “liked” it. I did some looking around while I was there and could see right away what a great page it is. 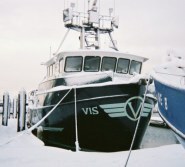 Updates on the season and the fleet are regular, and Washington Dungeness crab fishermen are also encouraged to post boat and crew pictures. 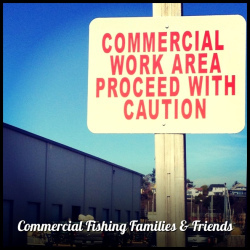 I love a positive and informative commercial fishing-themed Facebook page (if you do too, check out Commercial Fishing Families & Friends, the Facebook group I started with a couple other commercial fishing wives), so it’s great that the WDCFA has joined the fun. Speaking of Washington Dungeness crab fishing, George went to a meeting this morning for an update on the season’s start date. We’ve known for a while that the season is going to begin either (roughly) January 15 or January 25. I eagerly awaited word all day as to the firm date, but the only new thing I learned was that we’d all know in 48 hours what the final and official start date will be. Now, I normally do not get too hung up on the start date of crab season. I know it’s always sometime between December and January, and I just hope each year that G will be around for Christmas. I was a little nervous six years ago when I was expecting Eva, but George was able to be here for her birth on December 12 before leaving shortly after. A crab season start date of either January 15 or January 25 does not do me any personal good, as that is the exact date range that our third baby is due. Seriously—I’m not kidding. Her due date is January 25 and she will likely be encouraged out slightly before then, hence, the January 15-25 range. So, I will be waiting impatiently for the next two days until we found out exactly what we’re looking at. I do have plans in case there is no way G can be here; my parents are on board to help with my two children and dog, and I have three friends lined up to keep me company at the hospital and some more who have offered to help following the birth, but it’s still a messed-up situation. If a five-to-seven-day coastal storm blows through around the due date, making it impossible to crab, that would help. If not, I’ll cross my fingers for a different kind of miracle. Hey, my dad rushed in from salmon fishing in Puget Sound just in time to make it for my birth, and I know someone else who managed to take a sea plane off of his boat in Alaska, fly to shore, get to the airport, fly two hours to his home state, rent a car, drive two more hours home, and made it in time for the delivery of his daughter. I overheard George talking with Brett today about all of this. “I’m in a bit of a pickle,” George said. Um, yes. That’s one way of putting it. Just a few short weeks left to go! I also received a 3D video today of the baby moving around and looking cute.